The Orientation Committee is seeking enthusiastic, friendly and dedicated students to welcome the Class of 2022 to the Bulldog community through summer orientation. Orientation welcomes and introduces all first-year students and their families to Truman throughout the month of June and a late session in August. 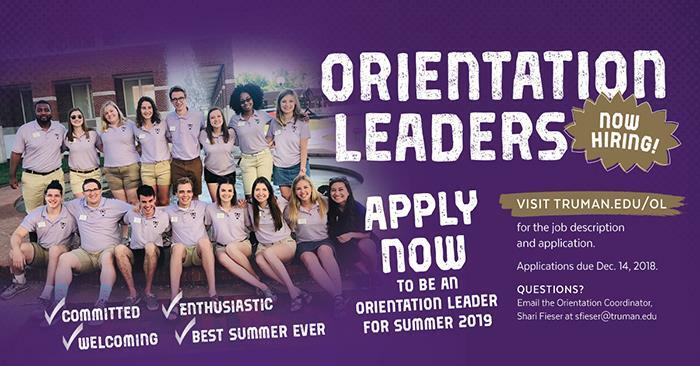 Orientation leaders have access to benefits such as impactful professional experience, a deeper understanding of the University, provided room and board if needed and a $1,500 taxable stipend. Applications are open now and are due Dec. 14. To read the full job description and to apply, visit truman.edu/ol or contact Shari Fieser, orientation coordinator, with any questions.